A few weeks back I was talkin' with my Momma. Every year our church does a homeless outreach at Thanksgiving where we bring in homeless people and not only do we feed them but give them a "survival kit" and have them attend service. I immediately got sad when it was time for them to go and was like, "So what happens now? We just bus them back to the streets?" My mom looks over and goes, "Yes ma'am? And then we get on social media and brag via pics and post and act like we really did somethin'!" My Momma's words really got me to thinkin'. I understand that one person can only do so much but by the same token it only takes one person to light a spark. But, how many times in life do we do somethin' just cause we like the "pageantry" of it all? You can thank Cutting Edge Going for the Gold for that beautiful line, as true as it is. EEK! I know i'm rarely serious on here but bare with me for a moment and don't go takin' away my sweet tea or blessin' my heart. HA! I'm still fastin' so I have no sweet tea for you to take. But, I'm bein' serious for a moment. If you ain't raisin' your hand then you is somethin' else cause we know we all do it. Heck just last week I took a pic of some vegetables just so I could post it on social media. I'm not sayin' that my church doesn't do things out of love. Cause they sure do. I'm just sayin' that I wanna make givin' love a lifestyle and not a "the-holidays-are-here-and-this-would-make-a-good-pic-style"
Ride or Die texted me the other day and asked if I wanted to help with a spa day for homeless people. Her text literally said, "Are your busy January 11? A friend is hosting something called 'Spa Days' for the homeless. Wanna come? Figure it goes with your #GiveLove goal <3" my immediate reply was, "Heck yeah. Lets do it." Y'all I was not prepared for this. It's amazing how you go thinkin' you're the one givin' somethin' when really you're the one bein' taught. 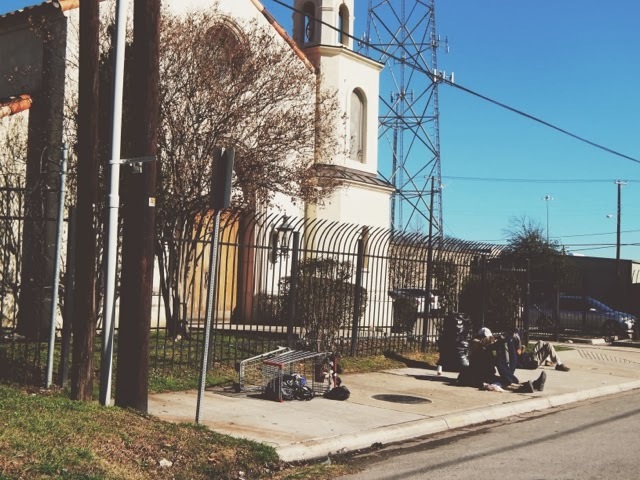 Austin Street Shelter is a homeless shelter downtown closer to the Deep Ellum District. My Dallas babies will understood. We went and gave the ladies mani/pedis. Y'all I met some of the nicest ladies who were just down on their luck. I failed to get her name but the first lady I met had such a beautiful smile. Never mind she was missin' a few teeth, her smile still reached her eyes. She asked me to paint her nails blue so she could impress her boyfran. Then she proceeded to make jokes about her missin' finger and how she was makin' it easier for me. She said that when she used to go to the nail salon she always got three dollars off cause there was no way she was gonna pay for 10 fingers worth of work when she only had 9. My seester came with us and she was to excited y'all. Growin' up it was a situation how much she loved homeless people. She was always puttin' our safety in jeopardy cause she wanted to talk to them, feed them, hug them , etc. She used to keep a jar in her room where she would collect change so she could then give to the random homeless people we would meet around Dallas. So when I invited her to come she didn't know what to do with herself she was so excited. There were many other ladies who we met and got to hear their stories. Some enclosed much details, some enclosed no details and some were just demanding. And that's ok too. I remember tearin' up at one lady who just wanted a foot rub with lotion. Somethin' so simple yet so profound at the same time. As I was workin' on a girl about my age I hear, "ya momma!" I immediately look up to see a woman a few years older than me, in a not so fittin' dress and matted dreads all over her head. My sister immediately ask her if she was from Southern Louisiana. She begin to smile as she told us of her home in New Orleans. I had so many questions. But fear of bein' rude caused me to hold my tongue. As we were leavin' my seester came runnin' from the bathroom to tell me someone was outside dyin'. Y'all, I was so rattled I didn't even want to walk out the door. Ride or Die then tells me that it's a situation and they have quite a few deaths a week. Homeless people walk over their to die cause they know there is always a helpful person and medical treatment. By the time we got out their, they already had the person in the ambulance. The ambulance was sittin' with the lights flashin' and my heart sank. I've had enough run-ins with death to know that when the light's are flashin' but the van isn't movin' it's never a good sign. All I could do was say a pray. I think what I took away most from my visit at the shelter is God's love. No, we weren't preachin'. No, we weren't throwin' bibles in their faces. No, we weren't condemnin' them and we sure as heck weren't judgin' them. Through somethin' as simple as pamperin' a few ladies on a Saturday afternoon we were not only able to brighten their day but we were able to give hope and show God's love. I'll always have my mom's words in my ear,"Their no different from you and I. Just a couple paychecks and that could be you"
God's love can be as simple as a bottle of ruby red nail polish. Remember that next time a homeless person harasses you for a spare dollar. There is always a story behind those tired eyes, frayed hands and worn body. A story yet to be told. While this is a weekly wish: show more love to the least of thee. It's more a lifestyle wish if anything. What a beautiful post and a beautiful service!! Went straight to my heart! That is truly a beautiful selfless way of showing God's grace on the most basic level. Well done to you, your family, and your church for showing love and mercy to "the least of these." I really wish more people would put forth the effort to help others in need..you would be surprised how much something as simple as a nice conversation or hug can make some ones day. You guys are truly awesome for doing this! What a beautiful piece. Thank you so much for sharing your compassion with others! God Bless! And thank you for reading. It could be us at one point in life. Never take the little things for granted. Reading beautiful post like these always remind me there are still some good souls left in this life. They are rare, but if you look hard enough, you'll see them. I think it's an amazing initiative and something most people should remember. It's indeed something that can happen very quick and to all of us. 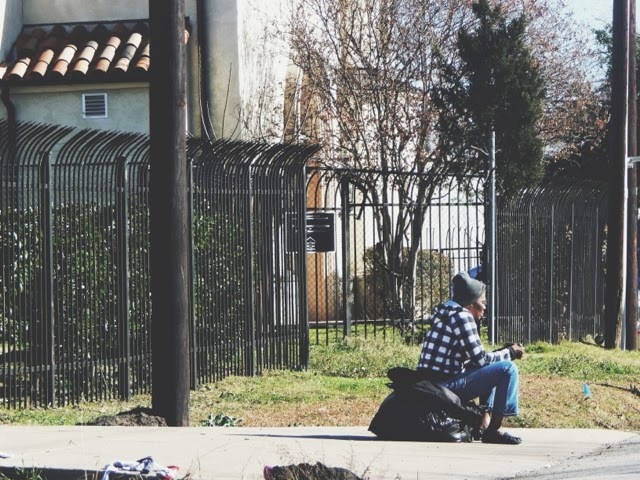 Each of those homeless people has a story and a life before. This is humbling. 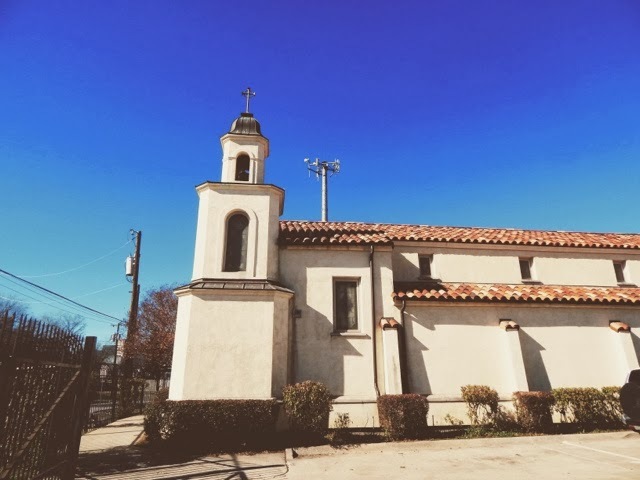 Austin Street Shelter does wonderful things. So many people with serious needs in our country and in our neighborhood. Yes ma'am, there really is. And if we just gave a little of our time here and there it would be a much better place. Aleshea! I am so...I ...I truly have a loss of words and that is very rare for me. This is amazing and you are so right! We tend to do things when it is the appropriate time and not all the time. Did Jesus heal only one a holiday? Or listen only on the Sabbath? If God told us we had to wait for our requests to be heard until it was the 'right' moment where would we be? Thank you for sharing such a wonderful post with me at #828Blessings...it was so touching and right on time! Please feel welcome to come and share or even simply partake with us every week... xoxoxo God Bless! Thank you Mrsteeh. Through all this fasting and prayer the Lord really has beein' openin' my eyes and showin' me. It makes me think of a quote I heard recently, "If you woke up today with only the things you thanked God for yesterday, what would you have?" Always something to ponder and think about. We can always use more love and compassion in our lives. Yes! WHat I hate about mission trips (as much as I love them) is this numbers mentality of "convert everyone then leave." that isn't love, it's ego boosting and it isn't helping anyone...It needs to be like the "Whatever you did for the least of these, you did for Me." Glad you got to partake in this! Thanks for the story and for the important reminder. I used to work with homeless youth here in Austin and it was rare that someone would treat them as a person not a problem. That's so sad but so great you worked with them. Homeless youth and young people always make me the saddest. They are so young to have such a hard life. This is awesome! You are awesome, friend!! I loved this post and really tugged at my heart strings!! You know I've always wanted to open my own homeless shelter. Takes a lot of work but it has always been a dream of mine. Good for you and your friends for going to help out. It takes a special kind of person & love to walk in those shoes-- God is love and right now he's smiling at how obedient his child is. :)(: Thanks Chene. I can't wait to go back. I don't know if I'll be able to do it every month with the ladies but I'm gonna try to go as often as I can. It was only a few hours out of my dare and I could spare a few more being just as loving and productive.